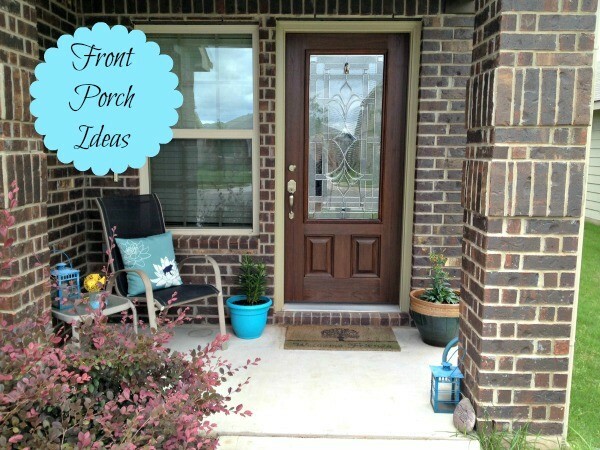 Do you need some front porch ideas? 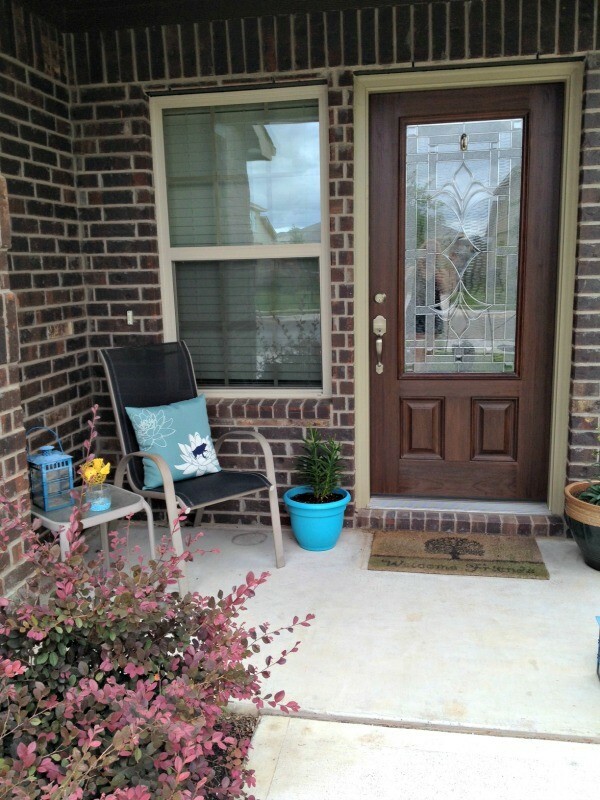 For Mother’s Day I was spoiled rotten and one of the gifts I received was some money to spruce up our front porch. We’re not able to put that deck I want in our back yard quite yet (it’s still a blank slate, but at least we have pretty green grass! ), but my husband wanted me to at least be able to do something with the front. Cue the awwwwww’s. He’s a keeper. I tend to lean to the minimal and simple when it comes to decorating. At least I think I do! 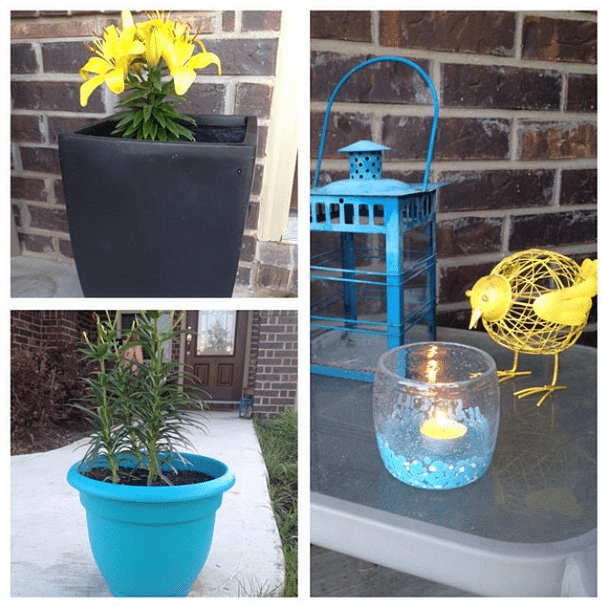 So all I added was a new pillow, a blue pot, pink & yellow flowers (there used to be yellow flowers – see picture below), a yellow bird, lanterns and a candle. It added some pops of color and it’s a nice place to sit. Here’s what the flowers used to look like before we went on vacation and someone (ahem, me) forgot to ask a neighbor to water them. This is from my Instagram feed. I purchased the flower pot and flowers from Lowes and the lanterns and bird from Pier 1 Imports. I still plan on replacing the chair, table and welcome mat soon. Our cement also needs a good scrubbing with some Oxy Clean to get rid of a few stains. But overall I’m pleased with the transformation that took minimal effort, time and money. It’s nice to have these pretty colors greet me every time I arrive home. If your porch is large enough for a hangout spot, place furniture for optimal conversation. If not, place furniture where it fits! I had just enough space for a chair and table. Play around with different positions and angles of the furniture until it works just right for the space. Add colorful pots and flowers to the space. Make sure the flowers you buy are the proper ones for the area. 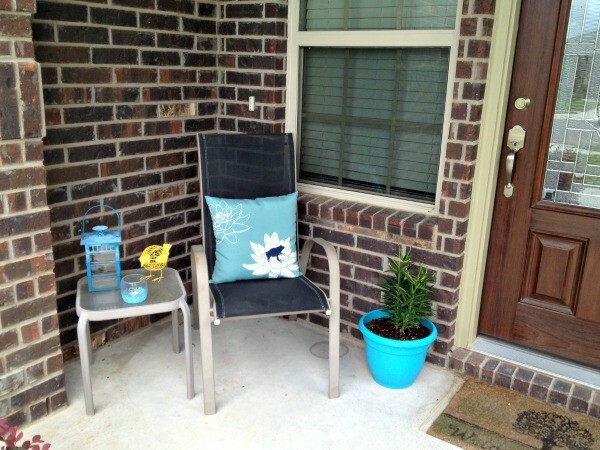 If your porch received tons of sun, make sure the flowers you purchase can withstand that. Place a welcome mat in front of the door to welcome in family and friends! Previous articleCute Outfit Ideas #35 – What’s Your Swim Suit Cover-Up Style? Next articleThe Perfect Summer Dress – Only $24.99, Deal Ends in 2 Days! I love your front door! Do you know the brand / style / stain etc? My husband and I have a long list of house projects and replacing our front door is one of them! Hi Jenni! Thank you! I fell in love with this door too. I’ll find out the name of it for you and get back to you. It’s on our house paperwork because I remember looking it up and then googling it to see what our door was going to look like. 😉 It’s amazing how just changing the door can completely change the way the front of your house looks.